Blood & Soul - Coming in 2020! The Bloodline Trilogy concludes with book three, Blood & Soul. Jenny Jardine lives a peaceful and idyllic childhood in the small Northern California town of Mendocino, the only child of Cabral and Darcy Jardine. Tall and palely blonde, unlike her small, dark-haired parents, Jenny often wonders if she was adopted. As a teenager, she discovers she has powers of healing. At first she dismisses her abilities as a fluke, but when she heals her cancer-stricken mother she realizes her unique talent could be used to help others. The realization also leads her on a journey to unearth her heritage. No matter how painful it becomes, she is determined to learn the truth about her true bloodline. Blood & Soul is scheduled for release in 2020. 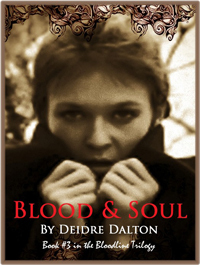 Click here to read a sample from Blood & Soul. Please Note: Storyline, estimated release date and book cover art for Blood & Soul may be subject to change. Copyright ©2019 Deidre Dalton | Webmaster: Webs Divine | Based on a design by Web Arte & Websitebaker.